A guilloché enamel, diamond, gold and silver gilt pill box originally purchased from Fabergé by Empress Maria Feodorovna in 1898. 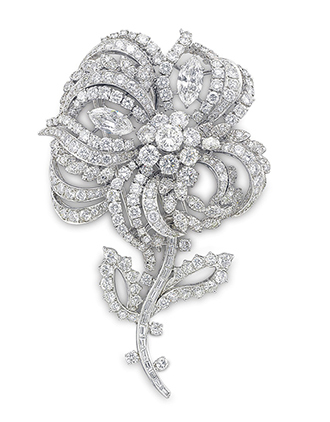 Rivers had the flower head on this 4-inch long brooch created from diamonds taken out of jewels in her collection. Harry Winston's signature is on the detachable stem. 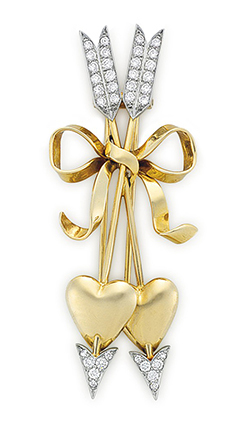 This gold arrow, heart and ribbon Retro brooch has been attributed to Paul Flato. 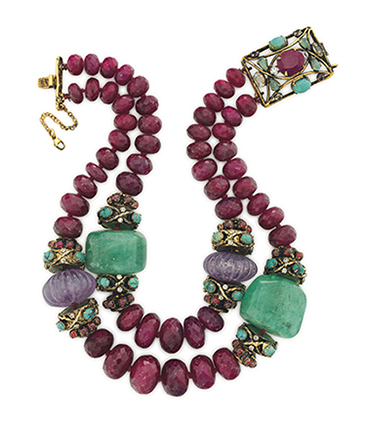 Iradj Moini designed this contemporary ruby, emerald and amethyst bead statement necklace. An ancient coin is at the center of this tricolor gold Tubogas bracelet by Bulgari. Joan Rivers was famous for her sharp humor. “I don’t exercise,” she once quipped. “If God had wanted me to bend over, he would have put diamonds on the floor.” Behind the comedic persona, however, there was a serious interest in jewelry. Ages ago when Penny Proddow and I were giving a talk at Christie’s in New York, Rivers was among those in attendance. She took notes and asked several astute questions. Her authentic passion for the subject was as clear as her wit in a nightclub. The CEO of Joan Rivers Worldwide, David Dangle, who was with her that day so many years ago, wrote an essay about Rivers’ appreciation for jewelry in the Christie’s auction catalogue of her Private Collection being sold on Wednesday, June 22 in New York. 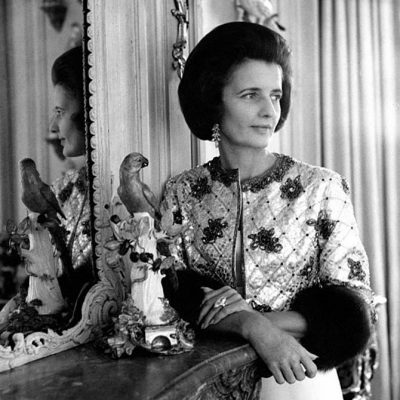 “When Joan looked at jewelry she saw history,” Dangle explains. “She loved all aspects of it especially the artisanship and meaning behind individual pieces.” To make sure she never missed a jewelry viewing opportunity, he says she always carried a jeweler’s loupe in her handbag. Rivers obviously had a jewelry gene. One of Dangle’s favorite jewelry memories with Joan was when they went to St. Petersburg for a week as guests of the Hermitage Museum and previewed the extraordinary object d’art. Fabergé represented an aesthetic she adored and it was a link back to her émigré mother’s Russian heritage. 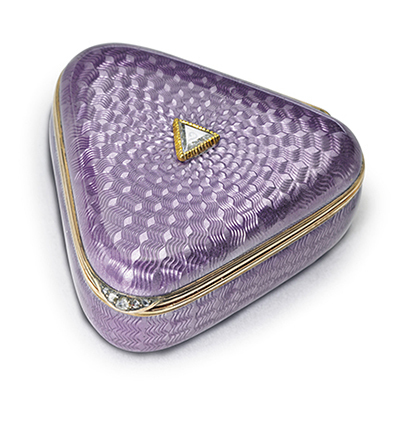 Among the many pieces in her collection is a stunning guilloché enamel, diamond and gold pill box with a royal provenance. It was originally purchased by Empress Maria Feodorovna from Fabergé in 1898. 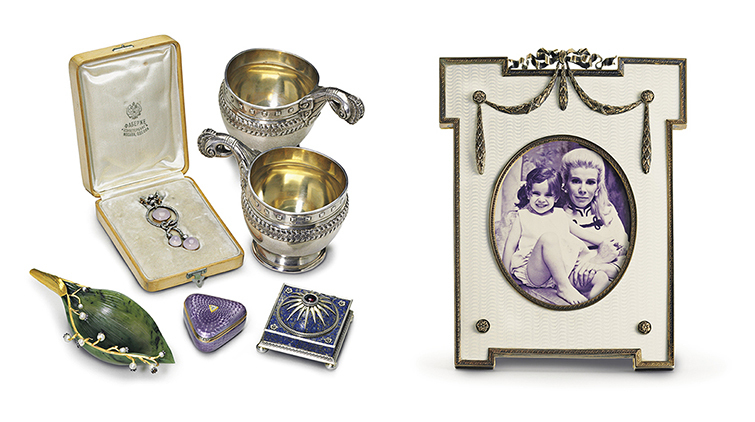 Undoubtedly with a bit of a wink and a smile, Rivers filled her collection of Fabergé frames that once would have held images of Russian royalty with personal family pictures. One frame features a college photo of her daughter Melissa in a Penn hoodie. 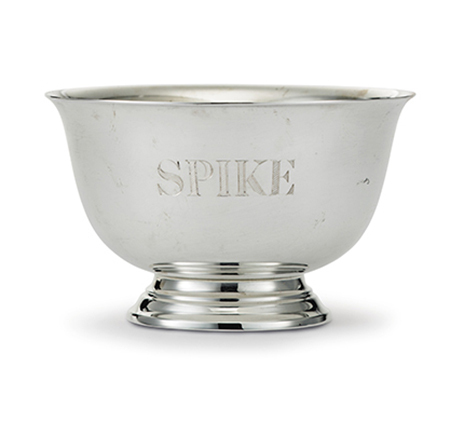 A fanciful luxury that feels as though it could have inspired a hilarious monologue is a Tiffany silver dog water bowl engraved with the name of Rivers’ Yorkshire Terrier Spike who made appearances with the comedian on The Tonight Show back in the day. Jewels in the collection reveal a range of statement pieces. There is a dazzling 4-inch long diamond flower brooch Rivers commissioned using diamonds taken out of jewels in her collection. The two marquise shaped stones in the piece came from a pair of earrings that belonged to her mother. Harry Winston’s signature is on the detachable stem. A whimsical vintage heart and arrow gold retro brooch attributed to Paul Flato is among her vintage jewels. Bold contemporary designs include a bead necklace by Iradj Moini. 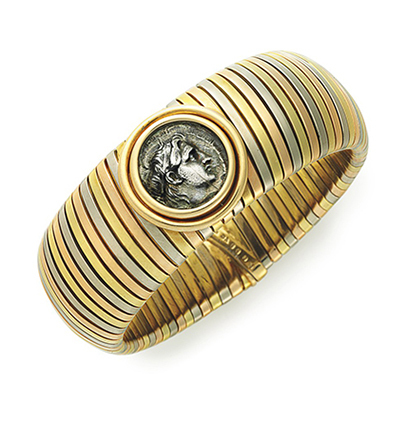 Twentieth century classics such as a tricolor gold Tubogas Bulgari bracelet set with an ancient coin are also in the collection. 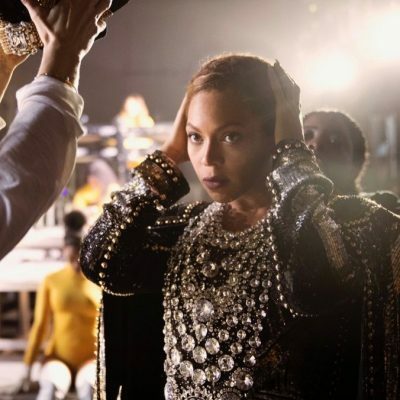 The selection of jewelry is among the 200 items from Rivers’ estate that will be in a live sale at Christie’s New York on Wednesday, June 22. An online sale that ends on Thursday, June 23 includes around 50 more jewels as well as clothing and accessories. A portion of the proceeds from these events will be donated to Rivers’ favorite charities.